This is more expensive from what you see on other sites because of size which here is 140cmx80cm and the others are 130cmx70cm. The size is very improtant. i have onw for a few years and t amazing . The cover and filling they have is also low grade, so think twice buying the cheep ones. Enjoy. PREMIUM MATERIAL - 100% soft velvet outer cover, durable brushed fabric inner cover and adjustable polyfill material offers persistent full and durability. 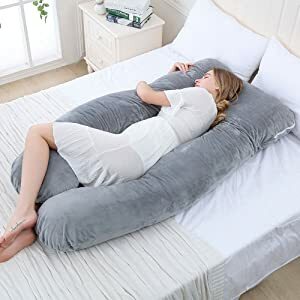 U-shaped body pillow design replaces need for multiple bed pillows, helping support head, back, belly, sides, knees, hip and feet. 100% CUSTOMER SATISFIED - M&M provides 30-day refund GUARANTEE if you are not satisfied for manufacturing faults. No questions asked! Customer satisfaction is our top priority. Are you still looking for a pillow that will help you to get a better & sweet sleep? Well, stop looking, because you've already found it! M&M u shape pregnancy body pillow, lets you off the hook! 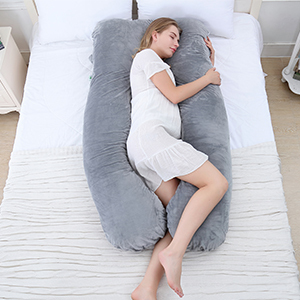 This new generation designed M&M pregnancy pillow is great for mothers to be or those who suffer from upper body pain, joint pain, leg swelling and back pain when sleeping. It's designed to cradle your body and help you enjoy a restful and relaxing night's sleep. Effectively offers improved blood circulation all night long and releases your body pressure. So, if you'd like to sleep more deeply, the cradling comfort and gentle support of this premium pillow can make it happen! Your full body pregnancy pillow comes in a vacuum-sealed plastic bag. Please pat & shake it lightly and leave it for several hours so the pillow can rise. The stuff / filling would be more fluffy and supportive if expose to the sun once every month. Please take out some filling if you feel it is too firm. Super comfortable for anyone who is needing more support, recovering from surgery, or tired of stacking multiple bed pillows to support their head, back, belly, knees, hip, and feet properly! 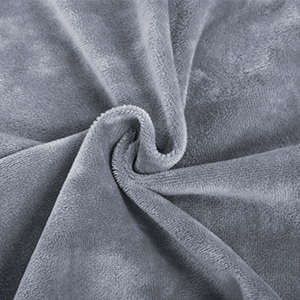 The soft velvet outer cover is hypoallergenic and machine washable. Perfect for everyone who is eager for a better sleep! Enjoy your deep sleep with superior full body support pillow now.